Stunning executive townhome in St George's Yard by Uniform Developments - GOHBA Design Award in 2011 for Housing Development of the year. 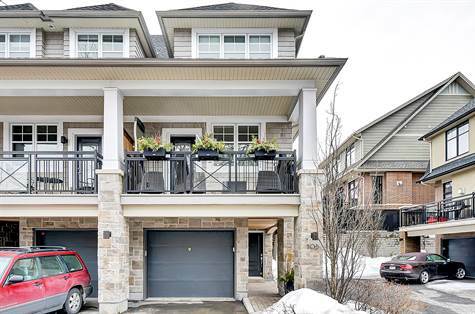 Features great entertainment space including generous living/dining area, gourmet kitchen, 2 large bedrooms, one bedroom with built in Murphy Bed to maximize your space, second floor laundry, main floor den or third bedroom, 4 bathrooms. Enjoy a glass of wine on your front balcony or entertain in the south facing urban back yard! Fabulous custom outdoor space for summer evenings with gas fire pit, waterfall, gas barbecue hook up and built-ins! Enjoy walking distance to shops, restaurants, theatre, bike and cross country ski paths! Single car garage and parking for a second car. Monthly Fee covers snow removal including walkways, insurance, seasonal maintenance and reserve fund.